The IPCC is experimenting with ways to make its reports more accessible. This beta site makes it easier to navigate between the Synthesis Report and the underlying Working Group contributions. To view the original versions of the reports, go to ipcc.ch/report/ar5 or the following microsites: Working Group I (The Physical Science Basis), Working Group II (Impacts, Adaptation, and Vulnerability), or Working Group III (Mitigation of Climate Change). This is a digital version of the IPCC 5th Assessment Synthesis Report and its Summary for Policymakers. The official PDF includes the front matter and annexes, and should be used for all references. In case you note any divergences between this digital version and the official versions of the reports please write to ipcc-sec@wmo.int. This summary follows the structure of the longer report, which addresses the following topics: Observed changes and their causes; Future climate change, risks and impacts; Future pathways for adaptation, mitigation and sustainable development; Adaptation and mitigation. The Synthesis Report (SYR) of the IPCC Fifth Assessment Report (AR5) provides an overview of the state of knowledge concerning the science of climate change, emphasizing new results since the publication of the IPCC Fourth Assessment Report in 2007 (AR4). Continued emission of greenhouse gases will cause further warming and long-lasting changes in all components of the climate system, increasing the likelihood of severe, pervasive and irreversible impacts for people and ecosystems. Limit-ing climate change would require substantial and sustained reductions in greenhouse gas emissions which, together with adaptation, can limit climate change risks. Adaptation and mitigation are complementary strategies for reducing and managing the risks of climate change. Sub-stantial emissions reductions over the next few decades can reduce climate risks in the 21st century and beyond, increase prospects for effective adaptation, reduce the costs and challenges of mitigation in the longer term and contribute to climate-resilient pathways for sustainable development. Many adaptation and mitigation options can help address climate change, but no single option is sufficient by itself. Effective implementation depends on policies and cooperation at all scales and can be enhanced through integrated responses that link mitigation and adaptation with other societal objectives. Unless otherwise stated, the information available on this website, including text, logos, graphics, maps, images, and electronic downloads is the property of the Intergovernmental Panel on Climate Change (IPCC) and is protected by intellectual property laws. You may freely download and copy the material contained on this website for your personal, non-commercial use, provided that the original source is properly acknowledged, without any right to resell, redistribute, compile or create derivative works therefrom. The designations employed and the presentation of material on maps do not imply the expression of any opinion whatsoever on the part of the IPCC concerning the legal status of any country, territory, city or area or of its authorities, or concerning the delimitation of its frontiers or boundaries. The IPCC is experimenting with ways to make its reports more accessible to the public and easier to navigate for different stakeholder groups. We are pleased to release this beta version of a website to present the Synthesis Report. Among other things this site makes it easy to navigate between the Synthesis Report and the underlying Working Group contributions. 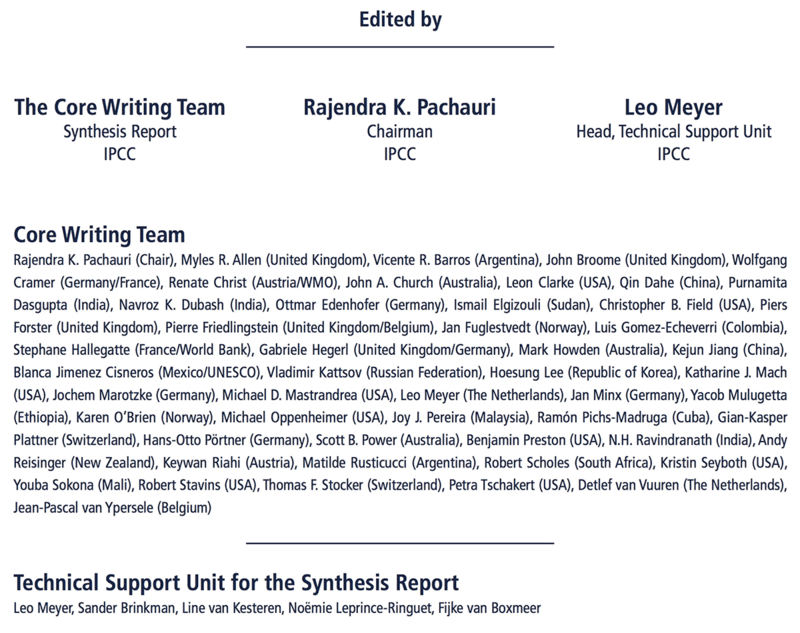 Users who wish to view the original versions of the reports in their official layout, with the full high-resolution graphics, are encouraged to go to ipcc.ch/report/ar5/ or the the Working Group microsites: Working Group I, Working Group II, and Working Group III. As this is a beta version, users are encouraged to inform the IPCC of any errors on this site in representing the official versions of the reports. Please write to ipcc-sec@wmo.int.